Here ya go! This super-easy, super-quick shawl is knit from the neck (top) down. Work with a thinner yarn and bigger needles for a lacey effect, or thicker yarn for something cozy and warm. Row 1 (RS): k1, yo, k1, yo, k1 (mark this st as centre st), yo, k1, yo, k1. Row 3 (RS): k1, yo, k to centre stitch, yo, k1, yo, k to last stitch, yo, k1. Increase on all RS rows as for row 3 while working garter and stockinette bands. This is what I did, but I did it randomly – so let your random inner self play! I ended with stockinette because I ran out of yarn, but I’d suggest ending off with a few rows of garter stitch to ward off any rolling. Continue working increases on all RS rows while alternating bands until shawl is big enough, or you run out of yarn. Bind off loosely in purl. Block, then weave in ends. So simple! Looks great – thanks for the pattern! Um, it says knit from the neck down, but if I read it right – isn’t it from the point up to the neck?? it looks great! what yarn did you use? does it look as good close up as from far away?! great color. I am making this pattern (and loving it!) in some manos, do you have any idea what your stitch count was when you bound off? I mean, how many stitches you had in the end? I’ve never made a shawl before, and i really don’t have any clue how long/big it’s supposed to be…Thanks! Love the pattern, it’s my first non-dishcloth knit project. Thanks so much for sharing! I just love your scarf. I have a couple of questions. Does this start at the top or bottom? What kind of yarn do you use? it says bulky, but it doesn’t look like bulky. And, you say you increase randomly, like how? 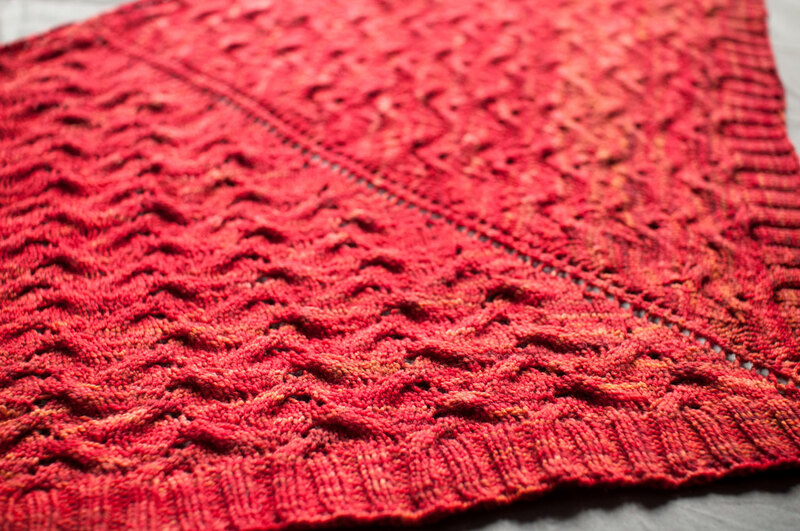 Very pretty shawl, especially in that striking red! Would you consider allowing Fiber Femmes to publish it for Nov/Dec issue? http://www.fiberfemmes.com is the website of this exciting e-magazine supporting, encouraging and promoting women in the fiber industry/arts. I see a lot of people asking about yardage, but no answers. I just completed the shawl, and I used 560 yards of bulky or chunky-weight yarn on size 11 needles. The finished shawl measures about 30″ deep and about 64″ across the top. It’s a great pattern, and was easy to knit. Thank you so much for posting about how yours turned out. I used it to make a shawl for my mother and it turned out beautifully. I’m a beginning knitter so the pattern was perfect for me. I just finished the shawl from some blue faced leicester that I had handspun. It came out just wonderful. It was for a friend of mine who is 100. She just loved it. Thanks for posting the pattern. I needed something I could finish in a hurry. Well, it’s like a mitered square backwards! That’s why it’s started from the top and worked down to the tip which turns up and in on itself to form a beautiful point. This is so clever! I love the simplicity of the project and then the way it looks so difficult. I’m bookmarking you and will visit often. Thank you! Thank you for posting this pattern. I came across it last week and started one using Lion Brand Homespun (Grape). Love the way it’s turning out. Oldest DD is going to love it when she receives it at her baby shower (she not into lacey frou-frou clothing). Not only do you have a great blog, but you have posted a wonderful shawl pattern. So generous of you to share it with all of us. I am ready to knit it up but would like to make it a bit larger. Can you tell me how to accomplish that? Please remember, I am a new knitter. Thank you for this pattern. I love shawls and simple ones are great! Thanks, I’m going to make this.I need something to cover up with at work because of the arctic temps when the a/c is working. I like this and think I will try it soon! You say increase every RS – that is every right side right? Also does RW & WS mean right side and wrong side? I would like to make this shawl if I could understand it. – it’s knit from the top down, ie neck first. The increases create the V shape. – RS = right side ws = wrong side, although it hardly matters with this pattern it’s more-or-less reversible. – do an increase Row 3 on every other row, purl or garter, whichever you’re on at the time. Every other Row will be a row 3, with all increases happening in knit rows. Hope that helps! It’s looking lovely, by the way. I’m making it in super-chunky so it’s been very quick and easy to see how the pattern works. I see the pattern in the form of a picture but can barely read it. Where can I get the Noro Mini Shawl pattern?? Thanks! How much yarn did this shawl use? I have 190 yds of bulky handspun merino that would be perfect. Thanks. I love this pattern. Pics on my blog. I made it for a friend diagnosed with cancer, and I can’t believe I finished it in less than a week, because I am not a fast knitter! This was much faster than a rectangular stole. The only issue I had was that the little ring I was using as a stitch marker wanted to slide under the yo and confuse me about which stitch was the center stitch. After a couple of incidents, I made sure to check that center stitch each time before knitting past it. Thanks so much for sharing this fun pattern. ummm,ok, I get rs and ws, and border, but where is the increase happening, please? Anywhere I like? Standard k into front and back of the stitch, or make 1, or my choice? What a gorgeous shawl! My high school art teacher said: “Simplicity is the essence of good design”. This shawl proves he was right! Thank you for making it available to the rest of us. Free patterns are most appreciated right now. It does say knit from the neck down yet it starts at a point.Also,i dont understand how you’re simply knitting rows and increasing but the finished shawl looks like you’re knitting in two directions? Where exactly is the starting point, is it at the bottom point of the;v; shape or at one of the other corners, or even in the middle, and do you make two of the same and then graft them together? I made this pattern many years ago and loved it but lost my copy of it. I am so glad to see it again and I cannot wait to make it. My shawl is coming out lopsided. Should the Row 3 yo, k1, yo be on either side of the center stitch or all on one side? Thanks! This is the very best shawl pattern, I feel, for anyone that is unsure of their yardage. You just keep on knitting until you run out of yarn, or it reaches a length you like, whichever comes first! But this is also perfect for using up leftover bits of yarn, in almost any colour or weight. Just change as desired. Yes, you start at the back of the neck, and proceed down to the length you want. Each row adds a couple of stitches, so your rows will get longer and longer. You will be knitting the outer edge all the time. You can insert any patterning you wish, but careful that you don’t get carried away. Keep it simple, letting the yarns show off. Use any weight, any fibre, any size needles. It’s all up to you! Great pattern, amazing. I thought it wasn’t going to work, but it does. Just follow the pattern and you’ll find that it works out. There are YO… but no decrease stitches of any kind. Every YO, therefore, IS an increased stitch. On the following row, you knit that YO as though it were a regular stitch in the row before. “Increase on all RS rows”… in the manner of Row 3 via YO that will be knit as new stitches on the following row. The bands are knit via groups of garter stitch, followed by groups of stockinette stitch. You can make your shawl as large or as small as you like, dependent first upon the amount of yarn you have to work with and second upon how large you want it to be if you’ve not run out of yarn but decide that’s big enough. Thanks for your help Elianastar. I’m knitting in a thick dark green wool on size 8 needles and it’s coming out beautifully. –Er: simple, yes. Not obvious when looking at the pattern perhaps, but nothing could be simpler. Am copying shamelessly Larissa Brown’s ‘melted crayons’ shawl and have something infinitely less funky– but me likey anyway. I just made one of these with my size 9 needles and some Caron Simply Soft heather gray and country blue. So pretty and so easy! Thank you so much for coming up with this one. Hi ~ I am using Noro Iro on size 11 32″ circular needles, and love it! I have more than enough yarn, just not sure when to stop. I have 325 yards in so far, and the depth measures approx 24″ with approx 160+ stitches across. If I am half-way, this will be one big-mama shawl! Of course, each row gets longer, and the ratio is not linear. Maybe I will make a hat with the last skein… Anyway, brilliant pattern, thanks. Simple yet gorgeous. Using Noro Chirimen…soft, textural…Love this pattern! I love this pattern! I was unsure a first how is was going to play out but I’m almost halfway done and it’s beautiful! If your confused looking at the pattern just follow the directions and it’ll make sense after a while! Thanks for posting this! I love this pattern. I made it for a friend who is undergoing chemo. She said her shoulders were always cold during the treatments, and the shawl warmed her and made her feel better (I used her favorite colors). The piece didn’t interfere with her iv’s. I made fringe on it, and I love the way it came out. So does my friend! Thank you so much for this simple and easy pattern.I really appreciate it!